Fire-walking: A key skill for EU Commissioners? The first Slovenian nominee for EU Commissioner, was Aleka Bratusek. As a result of odd electoral circumstances, she had managed to nominate herself, despite her party having just been voted out of office – but that’s another story. She gave a very lack-lustre performance at her parliamentary hearing (which I attended), and as a result, she was persuaded to withdraw. Her replacement is Violetta Bulc, Slovenia’s Development Minister She is a woman of remarkable views and skills. She has the ideal solution to global warming. She says “Natural environmental heat can be transformed directly into electrical energy”. Wonderful. We can cool the planet and generate electricity at the same time. I just hope that Violetta has a patent on the process, so that she can make a few kopeks out of it. Then, she is a campaigner for Syntropy. No, I don’t know what it is, either. But she refers to complex formulæ. And floods of emotions. So it must be important. She’s also a blogger. A recent blog is entitled “The vibrations of the white lions in the new era” . I haven’t read it in detail, but it shows an original angle. She has a Black Belt at Tae Kwan Do. But best of all – she’s a qualified Shaman and Fire-Walker! How about that? It never occurred to me before, but I guess fire-walking is a very valuable skill for an EU Commissioner-Designate. It might help her to negotiate some of the hot issues she’s sure to face. Only one problem: so far as I can find out, she doesn’t walk on water. But there. You can’t win ’em all. 15 Responses to Fire-walking: A key skill for EU Commissioners? I am now very frightened. Nurse….Nurse!! Mr Farage missing G. Fawkes party yesterday – and bar bills experience a drop? How takes did it take to stop himself from laughing? I can see it almost breaking through as he spoke. Are you serious Roger? A quick mental check as I was reading this confirmed it is not April 1st! With regular consistency the lunatics are slowly but surely taking over the asylum. Just like the three stooges plus another 500 odd we have over here not a cocking clue on business and industry and what a total mess our energy process is in. Could it be that power stations will be powered by lions dung? Don’t upset her too much or she may just kick your head off, literally……..
Pingback: Europe commits economic suicide – agrees massive emission cuts | Watts Up With That? 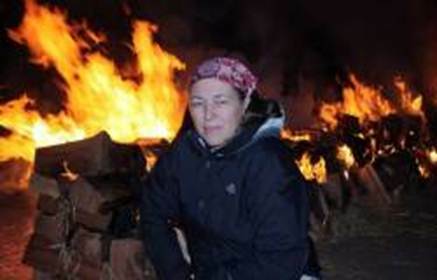 Notice the huge bonfire behind her for the firewalk coals. If she’s out to reduce her carbon footprint, I’d say she’s off to a bad start. She’ll be toast tomorrow !